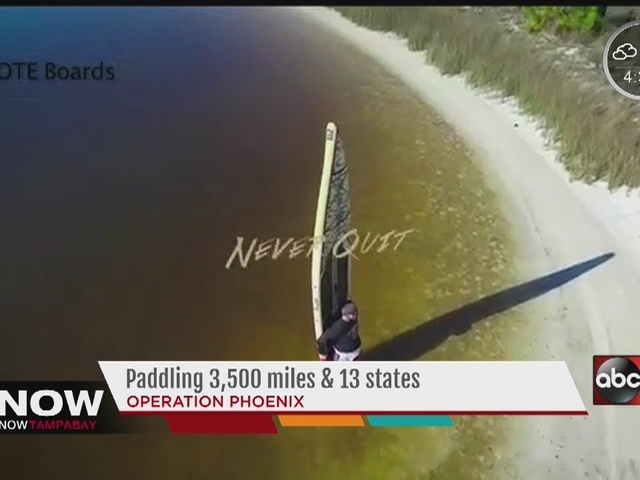 A Florida man is on voyage to set a Guinness World Record as he does a non-stop paddle board trip that will go 3,500 miles and 13 states. Josh Collins of Merritt Island, is paddle boarding the Tampa Bay area Friday and Saturday before continuing his journey to New York. Collins, a Special Operations Combat Veteran, served tours to Iraq and Afghanistan. The wounded warrior has seven documented traumatic brain injuries. Collins underwent treatment at James A Haley VA Polytrauma Unit in Tampa where he went through TBI therapy. Following his treatments and a dozen surgeries, his wife bought him a paddle board to regain his strength. In a documentary video by BOTE Boards, Collins tells of his journey and his decision to paddle part of the United States to help raise awareness for traumatic brain injuries and veterans. "I'm looking forward to spending time on the water, to kind of find myself," he told the documentary. On Friday, Collins paddled along Hernando Beach into Dunedin. He took off from Texas and will go to the Statue of Liberty. In all, he will be on the water for four months. There will be a meet and greet on Saturday in Clearwater on the north side of Pier 60. Collins should arrive on the beach at 12 p.m., but that time can vary. After meeting there, the greeting will move to Ron Jons/Hooters. To read about Operation Phoenix and Collins' voyage click here. You can also track where he is minute to minute here.